Carob tree is a species of flowering evergreen tree in the pea family, Fabaceae. Its scientific name is Ceratonia siliqua L.
It is widely grown for its edible pods, and as an ornamental tree in gardens. The ripe, dried pod is often ground to carob powder, which is used to replace cocoa powder. Carob bars, an alternative to chocolate bars, are often available in health-food stores. The tree is known in English as carob tree, St John's-bread or locust bean (not to be confused with the African locust bean). 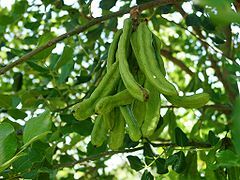 The word carob, used commonly for the fruit, comes from Middle French carobe (modern French: caroube), which borrowed it from Arabic خَرُّوبٌ (kharrūb, "locust bean pod"). Ceratonia siliqua, the scientific name of the carob tree given by Carolus Linnaeus to this plant, comes from the Greek kerátiοn κεράτιον 'fruit of the carob (from keras κέρας 'horn'), and Latin siliqua "pod, carob". The carat, a unit of mass for gemstones, and of purity for gold, takes its name, indirectly, from the Greek word for a carob seed, kerátion. The carob tree grows up to 15 m (49 ft) tall. The crown (the upper part of tree) is broad and semispherical, supported by a thick trunk with brown rough bark and solid and firm branches. Leaves are 10 to 20 cm (3.9 to 7.9 in) long, alternate and compound. Most carob trees are dioecious (with separate male an female plants) but some are hermaphrodite. The male trees do not produce fruit. The trees blossom in autumn. The flowers are small and in an inflorescence axis in racemes like catkins; the pollination is by both wind and insects. The fruit is a legume (also known as a pod). The pods take a full year to develop and ripen. The sweet ripe pods eventually fall to the ground and are eaten by various mammals (goats, sheep, cows), and so the hard seeds are dispersed. 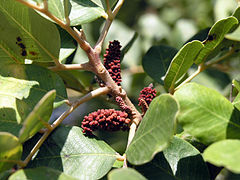 The carob tree is native to the Cyprus island, Egypt, Israel, Jordan, Lebanon, Libya, Saudi Arabia, Syria, Tunisia, Turkey. It is generally found within 30-45°N and 30-40°S and from sea level to an altitude of 500–1,000 m (1,600–3,300 ft). It has been introduced into regions with a similar Mediterranean climate. Carob eaten by humans is the dried (and sometimes roasted) pod. The pod have 5 to 18 hard brown seeds (10% of the pod weight) within a sweet thick pulp substance. Carob is mildly sweet and is used in powdered, chip, or syrup form as an ingredient in cakes and cookies, and as a substitute for chocolate. Carob bars are widely available in health food stores. A traditional sweet, eaten during Lent and Good Friday, is also made from carob pods in Malta. Carob pod meal is used as an energy-rich feed for livestock, particularly for ruminants, though its high tannin content may limit its use. In Cyprus, carob syrup is known as Cyprus's black gold, and is widely exported. In Malta, a syrup (ġulepp tal-ħarrub) is made out of carob pods. Carob syrup is also used in Crete as a natural sweetener, and is considered a natural source of calcium. It contains three times more calcium than milk. It is also rich in iron, phosphorus, and natural fibers (Due to its strong taste, it can be found mixed with orange or chocolate). Carob juice drinks are traditionally drunk during the Islamic month of Ramadan. Crushed pods may be used to make a beverage; compote, liqueur, and syrup are made from carob in Turkey, Malta, Portugal, Spain, and Sicily. Several studies suggest that carob may aid in treating diarrhea in infants. C. siliqua is widely planted in the horticultural as an ornamental plant for planting in Mediterranean climate and other temperate regions around the world, as in California and Hawaii. The plant can be used as a dense and large hedge. ↑ 1.0 1.1 "Carob". Online Etimology Dictionary. Retrieved 8 August 2016. ↑ 2.0 2.1 "Taxon: Ceratonia siliqua L." U.S. National Plant Germplasm System (NPGS/GRIN). Retrieved 8 August 2016. ↑ "sicula - sinuatus". Dictionary of Botanical Epithets. Retrieved 8 August 2016. ↑ "Ceratonia siliqua" (PDF). worldagroforestry.org. p. 2. Retrieved 8 August 2016. ↑ 5.0 5.1 5.2 Heuzé, V.; Sauvant, D.; Tran, G.; Lebas, F.; Lessire, M. (October 3, 2013). "Carob (Ceratonia siliqua)". Feedipedia.org. A programme by INRA, CIRAD, AFZ and FAO. Retrieved 8 August 2016. ↑ Maria T. (19 June 2015). "Bioaroma carob Syrup - ideal for sugar replacement-osteoporosis-weight loss". CretanSoil - best natural products. ↑ Fortier D, Lebel G, Frechette A (June 1953). "Carob flour in the treatment of diarrhoeal conditions in infants". Canadian Medical Association Journal 68 (6): 557–61. PMC 1822828. PMID 13059705. ↑ "Major Food And Agricultural Commodities And Producers – Countries By Commodity". Fao.org. Retrieved 8 August 2016. Wikimedia Commons has media related to Ceratonia siliqua. Wikispecies has information on: Carob tree. Purdue Univ: Fruits of Warm Climates: Carob treatment - horticulture and cultivars, species and native habitat treatment. This page was last changed on 18 December 2018, at 19:17.